Stockholders or others who wish to communicate with our Board or any individual director should direct their comments to 9900 West 109th Street, Suite 100, Overland Park, Kansas 66210, Attn: Secretary. Communications may also be sent by email to asktheboard@compassminerals.com. The company’s Secretary will forward any communications (excluding routine advertisements, business solicitations and communications that the Secretary deems to be a security risk or harassment) to each member of our Board or, if applicable, to the individual directors named in the correspondence. If the correspondence is directed exclusively for the independent directors or to one or more non-management directors, the communication will be delivered to the most tenured independent director or the non-management directors. Access to the online Ethics Hotline is available here or through the telephone numbers listed below. 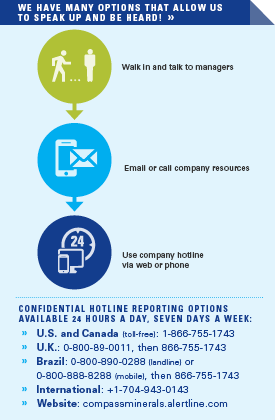 To support our compliance program, we make it simple for employees and others to report any concerns, using easy-to-access reporting methods. These include discussing the issue with a manager, emailing or calling a company resource (such as an HR business partner or a member of the Legal Team or Internal Audit Team) or using the Compass Minerals Ethics Hotline, which is operated by an independent third-party provider.